Amy Marcus at the Wall Street Journal has written a short story about the unexpected connection between NPC and Ebola today. It is a fascinating article that provides further compelling evidence about 2 concepts. Second, it appears that NPC Disease is the unintended outcome of genetic protections that may have evolved in order to protect us against horrible viruses like Ebola. 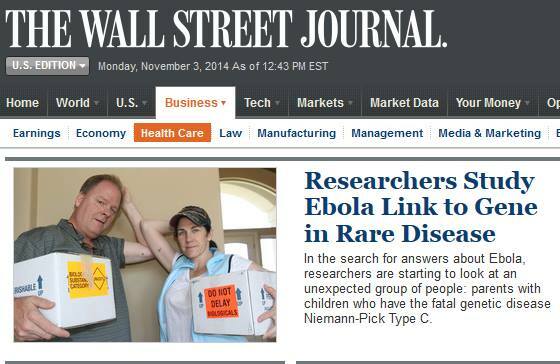 It appears (from the animal models) that carriers of NPC mutations are more likely to survive an Ebola infection. We donated our ‘fibroblasts’ (skin cells) in 2009 to a wonderful non-profit bio-bank called The Corriel Institute for Medical Research. We could not have imagined that our cells would be used by researchers to study Ebola and to discover that the NPC gene and it’s proteins could provide critical answers to how best to treat and protect against Ebola. The original article on the WSJ pay site is HERE. A reposted version of the article is HERE on the Global Genes website. You’ve got to LOVE supplements especially one called N-Acetyl Cysteine (NAC) when it can possibly help treat children afflicted with a rare and fatal cholesterol disease called Niemann Pick Type C (NPC). Considering there has only been only one clinical trial for Niemann Pick Type C ever conducted at the NIH (for a drug called Miglustat/Zavesca that costs about $80,000 per year, per child that is still not approved in the United States) it is quite exciting that we are starting a trial with NAC at a cost of about .20 cents per dose or approximately $350 dollars a year. NAC is an antioxidant that increases intracellular glutathione. Glutathione issues are a known problem in Alzheimer’s, Parkinson’s and many other neurological conditions. NAC can act as a precursor for glutathione synthesis as well as a stimulator of the cytosolic enzymes involved in glutathione regeneration. What is going on with intracellular glutathione? There must be a common pathway in all of these neurological conditions that is being disrupted (possibly lipids and cholesterol?). NAC can apparently stop people from pulling their hair out due to a obsessive-compulsive disorder called trichotillomania. Maybe I should try it? I have been pulling my hair out for months over the fact that I know there are more cheap over-the-counter supplements like NAC that could help not only NPC children, but millions of others. Thanks NIH for helping kids with Niemann Pick Type C! Our small community can do big things and we’ll make this NAC study a success! We would like to inform you of a new therapeutic trial that was approved this week by the NICHD IRB. The name of this study is Biomarker Validation for Niemann-Pick Disease, Type C: Safety and Efficacy of N-Acetyl Cysteine. This study still has to be reviewed by the FDA, but we are hopeful that we will be able to start enrolling patients in September 2009. 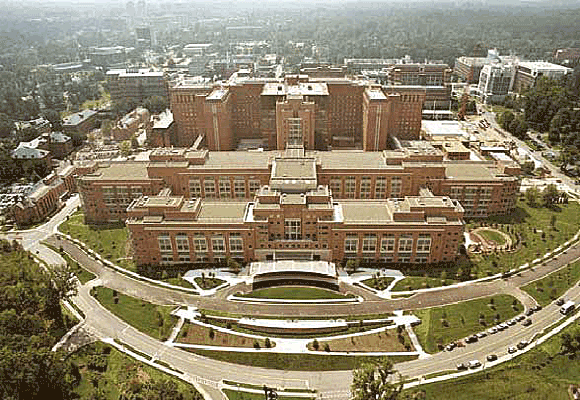 Many of you are familiar with the ongoing NPC natural history study at the NIH. As a result of this study, we have identified some promising biomarkers. Some of these biomarkers are related to oxidative stress, which leads to damage in the cells of the body. We would now like to move to the next step and begin to validate the use of these biomarkers. This clinical trial will hopefully lay the groundwork for future therapeutic trials. This new trial will allow us to both validate these biomarkers and begin to study the ability of N-Acetyl Cysteine (also called NAC) to treat the oxidative stress caused by NPC. NAC is an antioxidant that has been safely used in a variety of medical conditions in both young children and adults. In this study, we will use an effervescent tablet that will be dissolved in water or another clear liquid and taken by mouth three times a day. This will be a blinded, randomized, placebo-controlled cross-over trial. A cross-over trial means that means that each patient will receive NAC for an eight week period and placebo for an eight week period. The placebo does not have any NAC in it, but looks and tastes like the NAC tablet. Blinding means that patients and/or parents will not know the order in which the patient is receiving the NAC or placebo during the study. We will ask participants to come to the NIH for four outpatient visits over five months. The first admission will be a two day visit and the other three visits will require only one day. Each visit will include a history and physical exam, fasting blood draw, urine collection and a quality of life questionnaire. We will also ask patients to have blood drawn at home and sent to the NIH. Our goal is to have 30 patients complete the trial. There will also be two “washout” periods of four weeks each, during which neither NAC nor placebo will be given. We will ask patients to discontinue any supplements or medications except for miglustat (Zavesca) or those prescribed by a physician for the treatment of a medical condition other than NPC (such as seizures, ADHD, etc.) for the duration of the study. This is the only way that we can accurately evaluate the efficacy of NAC in NPC. Other supplements such as curcumin, CoQ10 and others could interfere with the study. We just can’t get good data if there are too many uncontrolled variables. When a new potential treatment becomes available in a rare disease like NPC, it can be very tempting for families to try it on their own rather than in a formal trial, especially one that includes a placebo. One reason for using a cross-over design was to make sure every patient received the drug during the trial. We understand this urge to try these treatments independently. However, if too many parents/patients choose to do this, we will never be able to get good information on drugs that are “off-the-shelf.” This ultimately will make NPC clinical research more difficult and slower. The NPC Natural History study has been more successful in the past three years than we ever could have imagined. This was only possible with the incredible support from the NPC families that participated and the NPC community as a whole. We will need continued participation to move this effort forward. Please call or email Nicole Yanjanin at (301) 594-1765 or nyanjanin@mail.nih.gov if you would like more information about the study or if you are interested in participating.